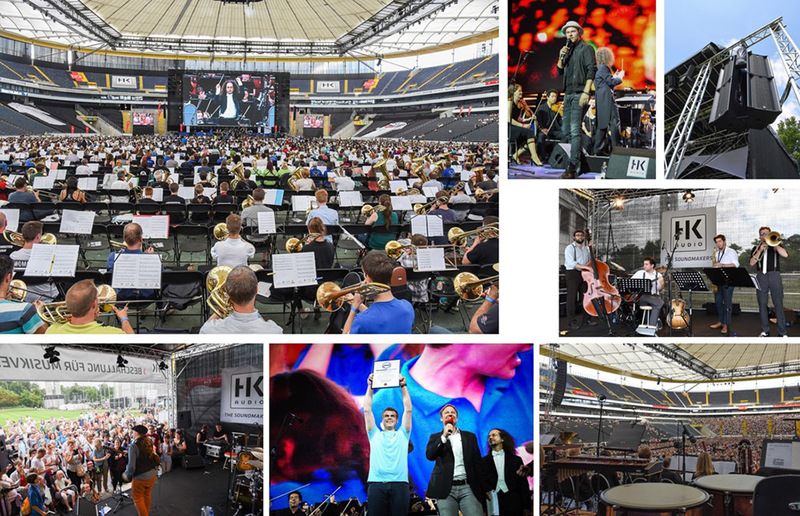 A vast HK Audio COHEDRA system helped power the biggest orchestra ever assembled to a new world record at Frankfurt's Wir Fuellen Das Stadion (We're Filling The Stadium) extravaganza. The COHEDRA setup had to keep up with more than 7,500 musicians (7,548, to be exact) and the Neue Philharmonie Frankfurt orchestra as the record was broken, and it performed admirably in the face of such an unusual application, helping provide an unforgettable experience for the 30,000 people present in the Commerzbank-Arena. After the world record was achieved, a celebratory concert featuring some of Germany's biggest popstars brought the evening to a suitably grand close. HK Audio's presence around the arena was strong throughout the day, with large LINEAR 5 setupspowering two live music stages, and an HK Audio Soundmakers zone where musicians and fans could experience the brand, get up close and personal with products like the LUCAS NANO 608i, and take photographs of themselves against a giant green screen.